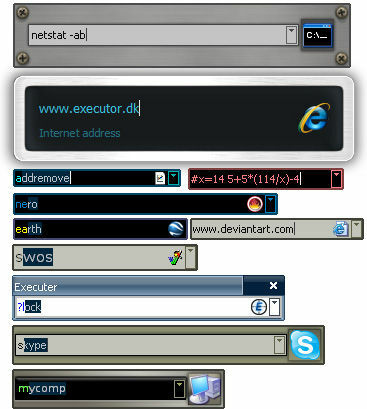 Executor is which is more powerful and customizable version of Windows "run" command. If you are sick of spending too much time searching for programs through Windows start-menu then Executor might be the solution for you. Keywords have properties like shortcuts, and you can for example drag-drop a shortcut/file/folder/favorite to add it as a keyword. Auto-completion for keywords, file system and history (can also be configured). Url detection, Enter URLs directly (like www.google.com, mail.google.com or http://www.google.com). Keywords support parameters. Example "google latest executor" "wiki nirvana". Besides keywords Executor can also optionally and dynamically add matching start-menu items, control panel items and other handy items to the drop-down/list. 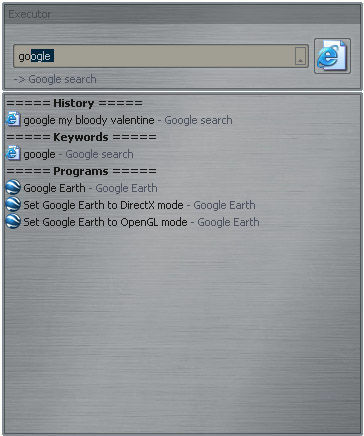 Keyword "find [text]" for using Windows Instant Search (Vista) feature or Windows Desktop Search (WDS for XP etc.). Optional show icon for current keyword/input. Optional show drop-down box for current keyword/input (auto-completion). 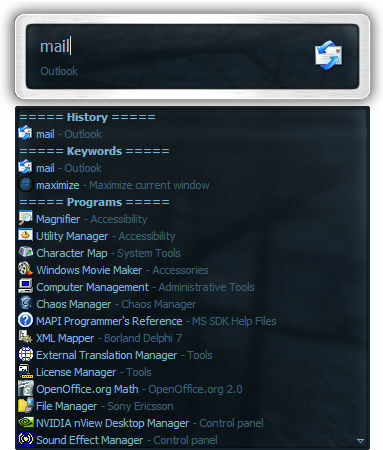 Optional drop-down box can be set to auto-open (like windows run) displaying auto-completion suggestions. Optional Vista like list displaying matching items. Layout can be customized. Set colors, font, dimensions, position, transparency and more. Each keyword can be assigned a hotkey, so Executor can also perform like many popular hotkey managers. Many settings to customize the program as you like. Shortcut keys for faster navigation. Can be launched from an user defined hotkey. One keyword or text input can start multiple keywords/urls/programs/documents/files etc. Example one keyword opens three websites and/or programs. A number of special commands (like for example pause and replace tag with parameter). Optional windows context-menu integration (as another way of easily adding new keywords). Optional show title for the current input. Can import keywords from windows start-menu. All file-paths can be auto-completed (also when file-path is a parameter). Option to override windows run hotkey (Win-R).